The discipline of yoga in its comprehensive form grants the practitioners with a sense of calmness, harmony, vitality, and wellness. We are well aware of the glorious benefits of yoga and its transformative powers. But, owing to the action-packed, modern life of the mankind, committing to a regular yoga practice seems to be an impossible task for many. The health regimen of the individuals of the fast-paced era gets crumbled under the heavy load of work-life balance, relationship troubles, and pseudo race to make more money and fame. On the road to commercial success, health and well-being are often left miles behind. With days filled with meetings and long to-do lists, physical activities and yoga often occupy the last spot in our priority list. The art of yoga is a physical practice that can be seamlessly adjusted in and around the responsibilities. It is a mental attitude to remain peaceful and aware in the episodes of stress and a spiritual upliftment worth seeking. In the midst of a busy lifestyle, give a boost to the physical and mental health with these five simple and effective techniques of including yoga on the go. Feel more vibrant and more powerful in just a few minutes. We are breathing every second taking about 23000 breaths every single day. Owing to our stressful lifestyle and overloaded work schedules many of us tend to breathe incorrectly. We take shallow breaths that result in less oxygen intake leading to the sensations of lethargy and lower focus levels. The key is to notice how we breathe and to make it a good breath. Master the art of deep and slow breaths and yogic breathing techniques which are long and relaxed breaths taken in by using the lungs’ full capacity. This increases the oxygen intake and release of carbon dioxide that tranquilizes the brain and energizes the body. 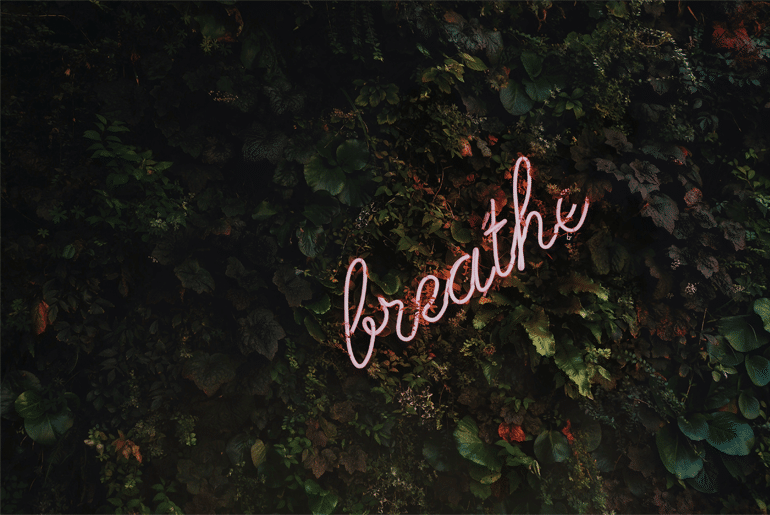 One can practice deep breaths while driving, standing in a queue waiting for the elevator, getting the kids ready or when in a situation of stress. When you are breathing smoothly and deeply, you are practicing yoga. Relaxation Breathing: Breathe in through the abdomen filling the lungs and stomach with air and breathe out through the nostrils. Triangle Breathing: First, breathe in and breathe out fully. Next, inhale, hold the breath and exhale for the same length of time. For instance, inhale for 4 counts, retain for 4 counts, and exhale for 4 counts. Try Alternate Nostril Breathing, KapalBhati, and Sheetali Pranayama as well. All day sitting in a chair with a hunched back and eyes glued to the screen is highly deteriorating for the health and the brain. The beauty of yoga is that it can be practiced anywhere, even in a chair! Practice chair yoga poses like: Chair cat-cow stretch, chair spinal twist, chair side angle pose, etc. In addition to this, perform some desk-stretching such as: neck stretch, side stretch, eagle arms, hamstrings stretch, upper back stretch, and so much more. Sneak in five-ten minutes from your busy schedule during lunch breaks or a short break to incorporate yoga. Keep a yoga mat handy and grab a peaceful spot wherever available for your daily asana performance. Mountain Pose (Tadasana): Stand Straight and stretch the hands upward. Camel Pose (Ustrasana): Sit halfway and reach back with your hands to grab the ankles. The ancient science of yoga is extremely flexible in aspects of time and place. If you have 5-10 minutes in the morning, dedicate it to meditation and embrace serenity. Take advantage of your traveling time to enhance your focus and mental peace. Sit straight on the public transport with face ahead and chant silently. Mothers can sing mantras to lullaby their kids to sleep. Listen to meditative sounds while driving. At work, use your meditative skills to focus and to be completely aware of the surroundings. Bring your attention to the breath and slowly to various parts of the body. Do not indulge in thinking. Keeping scanning the body, stay focused on breathing, and be in the moment. Traditionally, practicing Vajrasana after dinner is ideal as it helps the food settle down properly and enhances the digestive fire. Child Pose (Balasana) can be practiced before bedtime for bringing the body into a relaxed state for good night sleep. Ancient texts recommend the performance of Plough Pose at a gap of 30 minutes between dinner and bedtime for augmenting the biological functions of the body. On weekends, invest more time in yoga practices. Take this opportunity to practice yoga early in the morning and in the evenings as well. Increase your length of duration of practicing the yoga asanas, pranayama, and meditation. We all like to spend our ideal time doing the activities we love the most. So, couple your activities with yoga. Instead of sitting on a couch for binge-watching, try stretching, foam rolling, massage with therapy balls. Follow these tips to transform into a yogi even on a busy day. Do not include Yoga, Start Living It!